The two surveys collected here, carried out in 1989 and 2009, answer these questions, and many more. With in-depth responses from over 120 writers, and detailed analysis, British Science Fiction and Fantasy: Twenty Years, Two Surveys offers a comprehensive view of the state of British science fiction and fantasy, and charts the changes that have taken place in the field over the last two decades. Twenty Years, Two Surveys (ISBN 978-0-9558662-1-0) is edited and compiled by Paul Kincaid and Niall Harrison, and was published by the British Science Fiction Association in March 2010. All current BSFA members should have received a copy free; non-members can buy the survey through the BSFA website, for £7.99 plus postage and packaging. Elsewhere on this blog, you can read the original call for participants, and listen to a related panel discussion that took place at the 2009 BSFA/SFF AGM event, held on Saturday 27 June 2009. The introductions to this book, and to the original 1989 survey, are reproduced below. Finally, some authors’ individual survey responses have been made available online. Who writes sf and fantasy? How do they perceive their work? How do others – publishers, readers – perceive it? How do those perceptions change over time, or from place to place? Such questions are at the heart of the two surveys of writers of sf and fantasy collated and analyzed in this book, which attempt to take a snapshot of the state of the British sf and fantasy field. The first survey was carried out and analyzed by Paul Kincaid, for the Mexicon III convention, in 1989. The second has been carried out and analzyed this year, by me, on behalf of the British Science Fiction Association. So far as is practical, the 2009 survey has been designed to be comparable with the 1989 survey. The same ten questions have been used – along with one new question – the same style has been used to collate the answers, and in both cases the inclusion criteria were drawn as widely as possible, with both British-born and British-resident writers eligible to participate. For the 1989 survey, 44 writers responded, with a spread that Paul considered to be representative. This year, there were 84 responses, from 148 invitations and an open call for participants advertised in Locus Online, David Langford’s Ansible newsletter, and elsewhere. As in the 1989 survey, they run the gamut from famous to unknown, hard sf to fantasy, long established to new, and include writers published as “mainstream”, by sf/f genre publishers, and as Young Adult. (In both cases, approximately a quarter of respondents are women. For the 2009 survey, at least, this means women are slightly under-represented; they accounted for approximately a third of invitations.) Inevitably, there were many writers whose perspective I might have wished for who could not, or chose not to, respond; most commonly this was because they were busy with other projects. But broadly speaking, I consider the 2009 survey, like the 1989 survey, representative of the sf and fantasy field in the UK. The greater number of responses this year has enabled slightly more numeric analysis, although all coding of opinionated responses into neat little boxes should be taken as suggestive, rather than conclusive. Similarly, although I, like Paul, have attempted to provide a framework for what writers said, any analysis should be taken as tentative. Throughout the survey I have erred on the side of quoting writers at length, allowed them to speak for themselves to encourage readers to form their own conclusions as to any trends, and compare them with mine. Because I do think there have been changes. The BSFA survey is a showcase of a field that is, in many ways, in rude health: its practitioners often confident, ambitious, and enthusiastic, its products diverse and, in many cases, challenging notions of what “British science fiction and fantasy” is and can be. The responses contain many insights and provocations, but if the survey as a whole says one thing, I think it says this: 2009 is an exciting time to be reading these genres. On behalf of the BSFA, my thanks go to all those who responded to the survey; and my apologies to any writers I did not manage to contact in time. And to everyone: I hope you enjoy what follows. Any comments or queries can be sent to me at niall.harrison@gmail.com. In an obscure way, this survey was inspired by Algis Budrys, our guest at Mexicon III. While Greg Pickersgill and I were discussing Budrys’ critical work, Greg referred to a review, in Benchmarks, of something called the Double:Bill Symposium. This had been built around a survey of science fiction writers some twenty years ago, and the same thought occurred to us both: why not repeat the project, update it, tie it in to British science fiction. Hence the document you hold in your hands. The questions asked are simple, obvious, some would say too obvious. But in attempting to find, and define, common ground, one has to start from a very broad base. The survey was intended to produce a broad view of British science fiction, to provide at least a first step towards identifying what, if anything, are its distinguishing features. I must leave it to the reader to decide how successful it has been in that venture. Many British and British-based writers were approached. Some wrote back to apologise for not responding – Alan Garner, for instance, said that it would take a book to attempt an adequate response, and since he was deep into work on his next novel he wasn’t able to attempt a reply within the timeframe involve. Others spoke to me along the same lines. In the end, however, 44 writers replied, and the spectrum, from famous to unknown, from long-established to new, from hard sf to fantasy, was covered so well that I think this does provide a representative survey of the scene. On behalf of everyone involved in Mexicon, I want to thank all those who replied, and whose work provides the bulk of what follows. 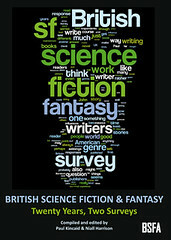 Once the definition of a science fiction or fantasy author has been achieved, the questions can drill down to get at more detailed information, asking about the strengths and weaknesses of the genre, how British science fiction and fantasy may differ from the genres as written elsewhere, reasons for writing in the genre and so forth. Kincaid and Harrison do an excellent job of summarizing the arguments put forth by the various authors while included lengthy excerpts from some of their responses, allowing the authors speak in their own words about their experiences, influences, and perceptions of the field. Kincaid and Harrison have compiled a wonderful book, not only a snapshot of the genre and community in1989 and 2009, but a look at the trends and growth of the genre during that time. The book also appears on the 2010 Locus Recommended Reading List.